By the early 19th century, Belfast became a major port. It played a key role in the Industrial Revolution, becoming the biggest linen-producer in the world, earning it the nickname "Linenopolis". By the time it was granted city status in 1888, it was a major centre of Irish linen production, tobacco-processing and rope-making. 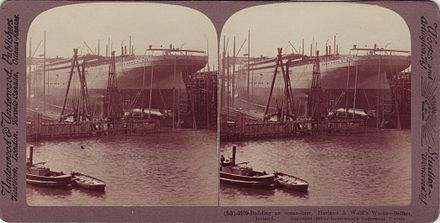 Shipbuilding was also a key industry; the Harland and Wolff shipyard, which built the RMS Titanic, was the world's biggest shipyard. Belfast as of 2019 [update] has a major aerospace and missiles industry. Industrialisation and the inward migration  it brought made Belfast Ireland's biggest city and it became the capital of Northern Ireland following the Partition of Ireland in 1922. Its status as a global industrial centre ended in the decades after the Second World War of 1939–1945. 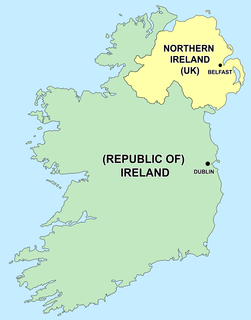 The Troubles was an ethno-nationalist conflict in Northern Ireland during the late 20th century. Also known internationally as the Northern Ireland conflict, it is sometimes described as an "irregular war" or "low-level war". The conflict began in the late 1960s and is usually deemed to have ended with the Good Friday Agreement of 1998. 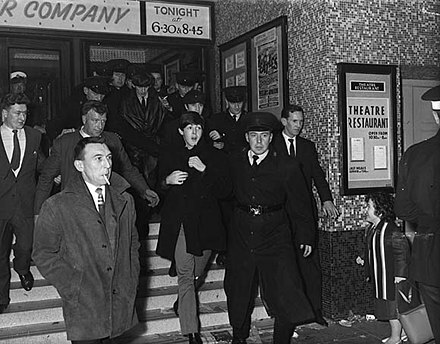 Although the Troubles primarily took place in Northern Ireland, at times the violence spilled over into parts of the Republic of Ireland, England, and mainland Europe. The River Lagan is a major river in Northern Ireland which runs 53.5 miles (86 km) from the Slieve Croob mountain in County Down to Belfast where it enters Belfast Lough, an inlet of the Irish Sea. 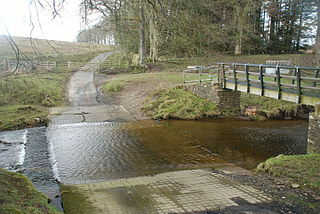 The River Lagan forms much of the border between County Antrim and County Down in the east of Ulster. It rises as a tiny, fast-moving stream near to the summit of Slieve Croob; Transmitter Road runs nearby. From here it continues on its journey to Belfast through Dromara, Donaghcloney and Dromore. On the lower slopes of the mountain, it is joined by another branch from Legananny (Cratlieve) Mountain, just opposite Slieve Croob. At Dromara, about four miles from its source, its height above the sea is 390 ft (119m). As the river continues on its journey to Belfast, it turns east to Magheralin into a broad plain between the plateaus of Antrim and Down. Edmund Ignatius Hogan S.J. (1831–1917) was an Irish Jesuit scholar. John O'Donovan, from Atateemore, in the parish of Kilcolumb, County Kilkenny, and educated at Hunt's Academy, Waterford, was an Irish language scholar from Ireland. The site of Belfast has been occupied since the Bronze Age. The Giant's Ring, a 5,000-year-old henge, is located near the city,  and the remains of Iron Age hill forts can still be seen in the surrounding hills. Belfast remained a small settlement of little importance during the Middle Ages. John de Courcy built a castle on what is now Castle Street in the city centre in the 12th century, but this was on a lesser scale and not as strategically important as Carrickfergus Castle to the north, which was built by de Courcy in 1177. The O'Neill clan had a presence in the area. 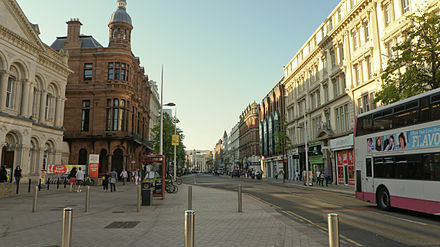 Belfast became a substantial settlement in the 17th century after being established as a town by Sir Arthur Chichester. It was initially settled by Protestant English and Scottish migrants at the time of the Plantation of Ulster. (Belfast and County Antrim, however, did not form part of this particular Plantation scheme as they were privately colonised.) In 1791, the Society of United Irishmen was founded in Belfast, after Henry Joy McCracken and other prominent Presbyterians from the city invited Theobald Wolfe Tone and Thomas Russell to a meeting, after having read Tone's "Argument on Behalf of the Catholics of Ireland". Evidence of this period of Belfast's growth can still be seen in the oldest areas of the city, known as the Entries. Belfast saw some of the worst of the Troubles in Northern Ireland, particularly in the 1970s, with rival paramilitary groups formed on both sides. Bombing, assassination and street violence formed a backdrop to life throughout the Troubles. The Provisional IRA detonated 22 bombs within the confines of Belfast city centre in 1972, on what is known as "Bloody Friday", killing eleven people. Loyalist paramilitaries including the Ulster Volunteer Force (UVF) and the Ulster Defence Association (UDA) claimed that the killings they carried out were in retaliation for the IRA campaign. Most of their victims were Catholics with no links to the Provisional IRA. A particularly notorious group, based on the Shankill Road in the mid-1970s, became known as the Shankill Butchers. Belfast was granted borough status by James VI and I in 1613 and official city status by Queen Victoria in 1888. Since 1973 it has been a local government district under local administration by Belfast City Council. Belfast is represented in both the British House of Commons and in the Northern Ireland Assembly. For elections to the European Parliament, Belfast is within the Northern Ireland constituency. 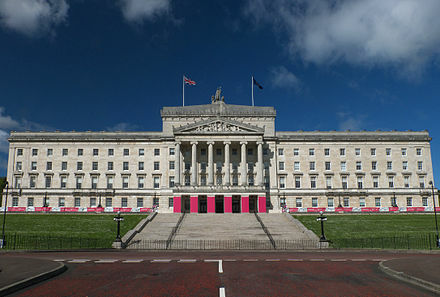 As Northern Ireland's capital city, Belfast is host to the Northern Ireland Assembly at Stormont, the site of the devolved legislature for Northern Ireland. Belfast is divided into four Northern Ireland Assembly and UK parliamentary constituencies: Belfast North, Belfast West, Belfast South and Belfast East. All four extend beyond the city boundaries to include parts of Castlereagh, Lisburn and Newtownabbey districts. In the Northern Ireland Assembly Elections in 2017, Belfast elected 20 Members of the Legislative Assembly (MLAs), 5 from each constituency. Belfast elected 7 Sinn Féin, 5 DUP, 2 SDLP, 3 Alliance Party, 1 UUP, 1 Green and 1 PBPA MLAs. In the 2017 UK general election, Belfast elected one MP from each constituency to the House of Commons at Westminster, London. This comprised 3 DUP and 1 Sinn Féin. 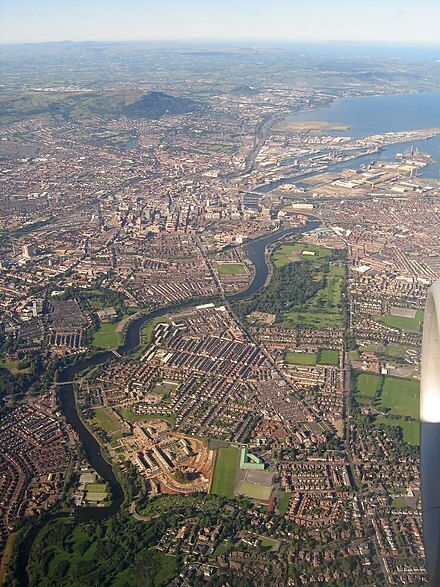 The city is flanked on the north and northwest by a series of hills, including Divis Mountain, Black Mountain and Cavehill, thought to be the inspiration for Jonathan Swift's Gulliver's Travels . When Swift was living at Lilliput Cottage near the bottom of Belfast's Limestone Road, he imagined that the Cavehill resembled the shape of a sleeping giant safeguarding the city. The shape of the giant's nose, known locally as Napoleon's Nose, is officially called McArt's Fort probably named after Art O'Neill, a 17th-century chieftain who controlled the area at that time. The Castlereagh Hills overlook the city on the southeast. The nearest weather station for which sunshine data and longer term observations are available is Belfast International Airport (Aldergrove). Temperature extremes here have slightly more variability due to the more inland location. The average warmest day at Aldergrove for example will reach a temperature of 25.4 °C (77.7 °F),  (1.0 °C [1.8 °F] higher than Stormont) and 2.1 days  should attain a temperature of 25.1 °C (77.2 °F) or above in total. Conversely the coldest night of the year averages −6.9 °C (19.6 °F)  (or 1.9 °C [3.4 °F] lower than Stormont) and 39 nights should register an air frost. Some 13 more frosty nights than Stormont. The minimum temperature at Aldergrove was −14.9 °C (5.2 °F), during December 2010. Since 2001, boosted by increasing numbers of tourists, the city council has developed a number of cultural quarters. 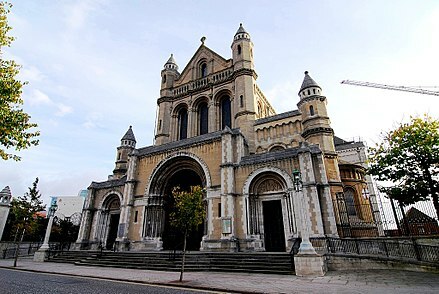 The Cathedral Quarter takes its name from St Anne's Cathedral (Church of Ireland) and has taken on the mantle of the city's key cultural locality. It hosts a yearly visual and performing arts festival. Among the city's grandest buildings are two former banks: Ulster Bank in Waring Street (built in 1860) and Northern Bank, in nearby Donegall Street (built in 1769). The Royal Courts of Justice in Chichester Street are home to Northern Ireland's Supreme Court. Many of Belfast's oldest buildings are found in the Cathedral Quarter area, which is currently undergoing redevelopment as the city's main cultural and tourist area. 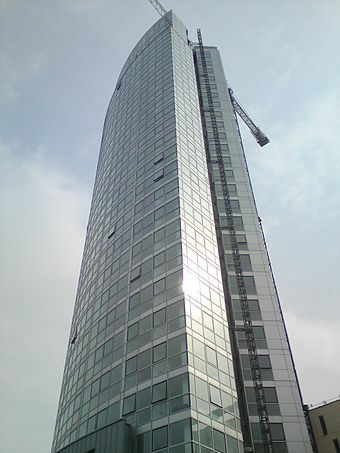 Windsor House, 262 ft (80 m) high, has 23 floors and is the second tallest building (as distinct from structure) in Ireland. Work has started on the taller Obel Tower, which already surpasses the height of Windsor House in its unfinished state. The ornately decorated Crown Liquor Saloon, designed by Joseph Anderson in 1876, in Great Victoria Street is one of only two pubs in the UK that are owned by the National Trust (the other is the George Inn, Southwark in London). It was made internationally famous as the setting for the classic film, Odd Man Out , starring James Mason. The restaurant panels in the Crown Bar were originally made for Britannic, the sister ship of the Titanic,  built in Belfast. Since the expansion of the European Union, numbers have been boosted by an influx of Eastern European immigrants. Census figures (2011) showed that Belfast has a total non-white population of 10,219 or 3.3%,  while 18,420 or 6.6%  of the population were born outside the UK and Ireland. Almost half of those born outside the UK and Ireland live in south Belfast, where they comprise 9.5% of the population. The majority of the estimated 5,000 Muslims  and 200 Hindu families  living in Northern Ireland live in the Greater Belfast area. 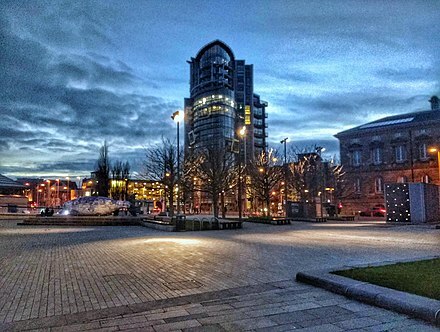 The IRA Ceasefire in 1994 and the signing of the Good Friday Agreement in 1998 have given investors increased confidence to invest in Belfast. This has led to a period of sustained economic growth and large-scale redevelopment of the city centre. Developments include Victoria Square, the Cathedral Quarter, and the Laganside with the Odyssey complex and the landmark Waterfront Hall. Around this time, the linen trade in Northern Ireland blossomed and by the middle of the 18th century, one fifth of all the linen exported from Ireland was shipped from Belfast. 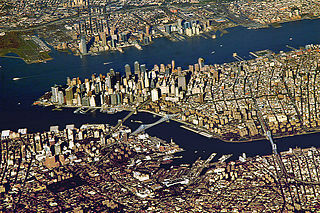 The present city however is a product of the Industrial Revolution. It was not until industry transformed the linen and shipbuilding trades that the economy and the population boomed. By the turn of the 19th century, Belfast had transformed into the largest linen producing centre in the world,  earning the nickname "Linenopolis". The Belfast Health & Social Care Trust is one of five trusts that were created on 1 April 2007 by the Department of Health. 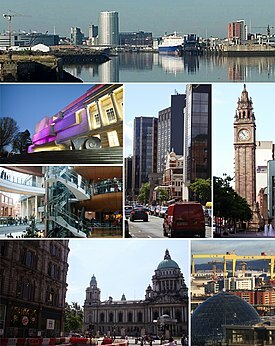 Belfast contains most of Northern Ireland's regional specialist centres. The Royal Victoria Hospital is an internationally renowned centre of excellence in trauma care and provides specialist trauma care for all of Northern Ireland. It also provides the city's specialist neurosurgical, ophthalmology, ENT, and dentistry services. The Belfast City Hospital is the regional specialist centre for haematology and is home to a cancer centre that rivals the best in the world. The Mary G McGeown Regional Nephrology Unit at the City Hospital is the kidney transplant centre and provides regional renal services for Northern Ireland. Musgrave Park Hospital in south Belfast specialises in orthopaedics, rheumatology, sports medicine and rehabilitation. It is home to Northern Ireland's first Acquired Brain Injury Unit, costing £9 million and opened by the Prince of Wales and the Duchess of Cornwall in May 2006. Other hospitals in Belfast include the Mater Hospital in north Belfast and the Children's Hospital. Commentators have argued that this may create a bottleneck at York Street, the next at-grade intersection, until that too is upgraded. [ citation needed ] On 25 October 2012 the stage 2 report for the York Street intersection was approved  and in December 2012 the planned upgrade moved into stage 3 of the development process. If successfully completing the necessary statutory procedures, work on a grade separated junction to connect the Westlink to the M2/M3 motorways is scheduled to take place between 2014 and 2018,  creating a continuous link between the M1 and M2, the two main motorways in Northern Ireland. The Ulster Orchestra, based in Belfast, is Northern Ireland's only full-time symphony orchestra and is well renowned in the United Kingdom. Founded in 1966, it has existed in its present form since 1981, when the BBC Northern Ireland Orchestra was disbanded. The music school of Queen's University is responsible for arranging a notable series of lunchtime and evening concerts, often given by renowned musicians which are usually given in The Harty Room at the university (University Square). U2, Van Morrison, Snow Patrol, Simple Minds, Elton John, Rogue Male, Katie Melua, Boney M, Paul Muldoon, Stiff Little Fingers, Nanci Griffith, Glenn Patterson, Orbital, James Taylor, Fun Boy Three, Spandau Ballet, The Police, Barnbrack, Gary Moore, Neon Neon, Toxic Waste, Energy Orchard, and Billy Bragg. Like all areas of the island of Ireland outside of the Gaeltacht, the Irish language in Belfast is not that of an unbroken intergenerational transmission. Due to community activity in the 1960s, including the establishment of the Shaws Road Gaeltacht community, the expanse in the Irish language arts, and the advancements made in the availability of Irish medium education throughout the city, it can now be said that there is a 'mother-tongue' community of speakers. [ dubious – discuss ] The language is heavily promoted in the city and is particularly visible in the Falls Road area, where the signs on both the iconic black taxis and on the public buses are bilingual. 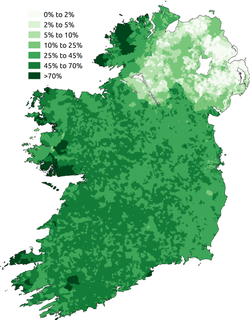 Belfast has the highest concentration of Irish speakers in Northern Ireland. [ citation needed ] Projects to promote the language in the city are funded by various sources, notably Foras na Gaeilge, an all-Ireland body funded by both the Irish and British governments. There are a number of Irish language Primary schools and one secondary school in Belfast. The provision of certain resources for these schools (for example, such as the provision of textbooks) is supported by the charitable organisation TACA. Belfast is the home of the Belfast Telegraph , Irish News , and The News Letter , the oldest English-language newspaper in the world still in publication. The city has a number of free publications including Fate magazine, Go Belfast, and the Vacuum , that are distributed through bar, cafes and public venues. Belfast is home to over twenty Gaelic football and hurling clubs. Casement Park in west Belfast, home to the Antrim county teams, has a capacity of 32,000 which makes it the second largest Gaelic Athletic Association ground in Ulster. 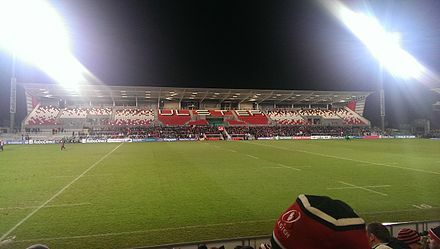 The 1999 Heineken Cup champions Ulster Rugby play at Ravenhill Stadium in the south of the city. Belfast has four teams in rugby's All-Ireland League: Belfast Harlequins in Division 1B; and Instonians, Queen's University and Malone in Division 2A. Other significant sportspeople from Belfast include double world snooker champion Alex "Hurricane" Higgins  and world champion boxers Wayne McCullough and Rinty Monaghan. Leander A.S.C is a well known swimming club in Belfast. Belfast produced the Formula One racing stars John Watson who raced for five different teams during his career in the 1970s and 1980s and Ferrari driver Eddie Irvine. ↑ Weather station is located 3.9 miles (6.3 km) from the Belfast city centre. ↑ Weather station is located 12.6 miles (20.3 km) from the Belfast city centre. Derry, officially Londonderry, is the second-largest city in Northern Ireland and the fourth-largest city on the island of Ireland. The name Derry is an anglicisation of the Old Irish name Daire meaning "oak grove". In 1613, the city was granted a Royal Charter by King James I and gained the "London" prefix to reflect the funding of its construction by the London guilds. While the city is more usually known colloquially as Derry, Londonderry is also commonly used and remains the legal name. Queen's University Belfast is a public research university in Belfast, Northern Ireland. 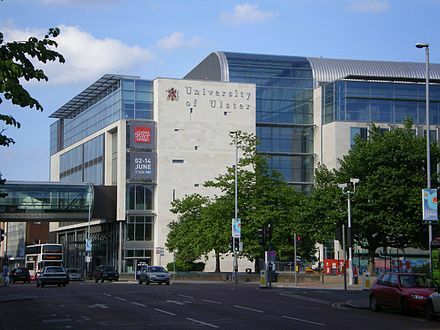 The university was chartered in 1845, and opened in 1849 as "Queen's College, Belfast". 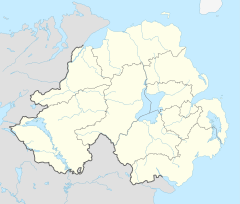 Belfast North is a parliamentary constituency in the United Kingdom House of Commons. The Shankill Road is one of the main roads leading through west Belfast, in Northern Ireland. It runs through the working-class, predominantly loyalist, area known as the Shankill. 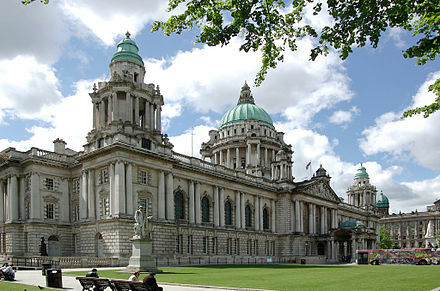 Belfast City Council is the local authority with responsibility for part of the city of Belfast, the capital and largest city of Northern Ireland. The Council serves an estimated population of 333,871 (2011), the largest of any district council in Northern Ireland, while also being the fourth smallest by area. 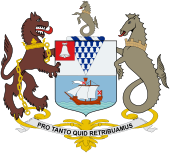 Belfast City Council is the primary council of the Belfast Metropolitan Area, a grouping of six district councils with commuter towns and overspill from Belfast, containing a total population of 579,276. SS Nomadic is a former tender of the White Star Line, launched on 25 April 1911 in Belfast now on display in Belfast's Titanic Quarter. She was built to transfer passengers and mail to and from RMS Olympic and RMS Titanic, and is the only White Star Line vessel in existence today. Belfast City Hall is the civic building of Belfast City Council located in Donegall Square, Belfast, Northern Ireland. It faces North and effectively divides the commercial and business areas of the city centre. Titanic Quarter in Belfast, Northern Ireland is a large-scale waterfront regeneration, comprising historic maritime landmarks, film studios, education facilities, apartments, a riverside entertainment district, and the world's largest Titanic-themed attraction centred on land in Belfast Harbour, known until 1995 as Queen's Island. The 185-acre (75 ha) site, previously occupied by part of the Harland and Wolff shipyard, is named after the company's, and the city's, most famous product RMS Titanic. Titanic Quarter is part of the Dublin-based group, Harcourt Developments, which has held the development rights since 2003. Nelson McCausland is a Unionist politician from Northern Ireland. He is a member of the Democratic Unionist Party and was an MLA for North Belfast from 2003 until he lost his seat in 2017. He served as Minister of Culture, Arts and Leisure (2009–2011) and Minister for Social Development (2011–2014) in the Northern Ireland Executive. The Belfast quarters are distinctive cultural zones within the city of Belfast, Northern Ireland, whose identities have been developed as a spur to tourism and urban regeneration. These "quarters" differ from the traditional districts into which Belfast is divided. 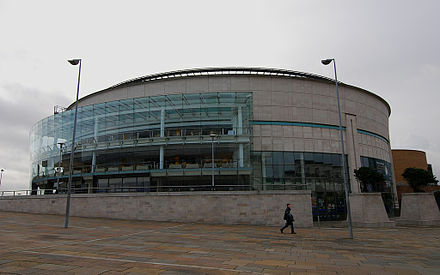 The buildings and structures of Belfast, Northern Ireland comprise many styles of architecture ranging from Edwardian through to state-of-the-art modern buildings like the Waterfront Hall. The city's beautiful Edwardian buildings are notable for their display of a large number of sculptures. Many of Belfast's Victorian landmarks, including the main Lanyon Building at Queens University in 1849, were designed by Sir Charles Lanyon. The economy of Belfast, Northern Ireland was initially built on trade through Belfast Harbour. Later, industry contributed to its growth, particularly shipbuilding and linen. At the beginning of the 20th century Belfast was both the largest producer of linen in the world and also boasted the world's largest shipyard. Civil unrest impacted the city's industry for many years, but with the republican and loyalist ceasefires of the mid-2000s, and the St Andrews Agreement in 2006, the city's economy has seen some resurgence once again. Watching and playing sports is an important part of culture in Belfast, Northern Ireland where almost six out of ten (59%) of the adult population regularly participate in one or more sports. Belfast has several notable sports teams playing a diverse variety of sports including football, rugby, traditional Irish Gaelic games, and North American sports such as American football and ice hockey. The Belfast Marathon is run annually on May Day, and attracted 14,300 participants in 2007. Transportation systems in the city of Belfast, Northern Ireland include road, air, rail, and sea. It is still a relatively car dependent city however it is also served by a comprehensive rail and bus network. Belfast also ran electric trams prior to 1954. 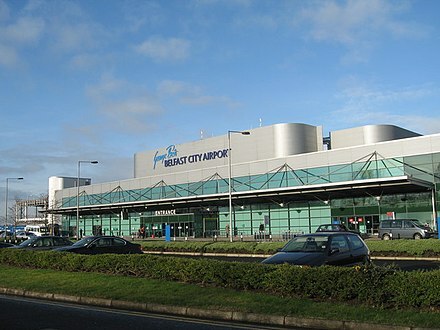 The city has two major airports and the Port of Belfast is the busiest ferry port on the island of Ireland. Northern Ireland Screen is the national screen agency for Northern Ireland. The agency's purpose is to promote the development of a sustainable film, animation and television production industry. Laganbank was one of the nine district electoral areas in Belfast, Northern Ireland which existed from 1985 to 2014. Located in the south of the city, the district elected five members to Belfast City Council and contained the wards of Ballynafeigh, Botanic, Shaftesbury, Stranmillis, and Rosetta. Laganbank, along with neighbouring Balmoral, formed the greater part of the Belfast South constituencies for the Northern Ireland Assembly and UK Parliament. Events during the year 2012 in Northern Ireland. 1 2 "Population Estimates for UK, England and Wales, Scotland and Northern Ireland, Mid-2017". Office for National Statistics. 28 June 2018. Retrieved 28 June 2018. ↑ "Belfast Metropolitan Area Plan" (PDF). Planningni.gov. Retrieved 11 April 2018. ↑ Wakefield, Edward (1812). An account of Ireland, statistical and political: in two volumes. 2. London: Longman, Hurst, Rees, Orme and Brown. pp. 693–694. ↑ "Census for post 1821 figures". Cso.ie. Archived from the original on 20 September 2010. Retrieved 12 August 2010. ↑ "Home". Histpop.Org. 2 April 2007. Archived from the original on 7 May 2016. Retrieved 13 November 2010. ↑ "Northern Ireland Census of Population". Northern Ireland Statistics and Research Agency. Archived from the original on 4 April 2010. Retrieved 12 August 2010. ↑ Lee, J. J. (1981). "On the accuracy of the Pre-famine Irish censuses". In Goldstrom, J. M.; Clarkson, L. A. (eds.). Irish Population, Economy, and Society: Essays in Honour of the Late K. H. Connell. Oxford, England: Clarendon Press. ↑ "Belfast City Council. Belfast: A Profile of the City. Demographics". Belfastcity.gov.uk. Archived from the original on 25 September 2010. Retrieved 12 August 2010. ↑ "Where are the largest cities in Britain? – CityMetric". Citymetric.com. Retrieved 11 April 2018. ↑ "BBC – History – Belfast's golden age of shipbuilding". Bbc.co.uk. Archived from the original on 26 March 2018. Retrieved 11 April 2018. ↑ Kelly, Mary (April 2013). "Historical Internal Migration in Ireland" (PDF). GIS Research UK. ↑ "These are the 15 safest cities in Britain". independent.co.uk. Retrieved 11 September 2016. ↑ "The World According to GaWC 2018". Globalization and World Cities (GaWC) Study Group and Network. Loughborough University . Retrieved 25 January 2019. 1 2 3 4 "Placenames Database of Ireland – Belfast: view the scanned records". Logainm.ie. Retrieved 25 May 2014. 1 2 "Placenames/Logainmneacha – Belfast". BBC Northern Ireland – Education. BBC. Retrieved 17 May 2007. ↑ Keenan, Desmond (2000). Pre-Famine Ireland. XLibris.com. Chapter 5. ↑ "Placenames Database of Ireland – Belfarsad". Logainm.ie. Retrieved 13 November 2010. ↑ Hogan, Edmund (1910). Onomasticon Goedelicum. Dublin. ; O'Donovan, John (1856). Annals of the Kingdom of Ireland. Dublin. ↑ "Ulster Scots Language & Dialects of Ulster". The Linen Hall Library. Archived from the original on 25 February 2013. Retrieved 3 March 2016. ↑ 2006 annual report in Ulster-Scots Archived 27 February 2013 at the Wayback Machine North/South Ministerial Council. ↑ "Equality Impect Assessment o tha Draft Ullans Leid Policy" (PDF). Mid Ulster District Council. Retrieved 16 May 2017. ↑ "North-South Ministerial Council: 2010 Annual Report in Ulster Scots" (PDF). Archived from the original (PDF) on 27 February 2013. Retrieved 2 August 2014. ↑ "North-South Ministerial Council: 2009 Annual Report in Ulster Scots" (PDF). Archived from the original (PDF) on 1 April 2014. Retrieved 2 August 2014. ↑ "Belfast City Hall". Discover Northern Ireland. Ireland Tourist Board. Archived from the original on 16 June 2007. Retrieved 18 May 2007. ↑ "Belfast, Newcastle and the County Down Coast". County Down Northern Ireland. GoIreland.com. Archived from the original on 19 December 2008. Retrieved 17 January 2009. ↑ "A walk on the outskirts of Belfast: Giant's Ring Trail, Northern Ireland". The Guardian . 12 May 2012. Retrieved 1 June 2014. ↑ Komesu, Okifumi (1990). Irish Writers and Politics. Rowman & Littlefield. p. 73. ISBN 978-0-389-20926-3. ↑ "Celebrations mark the arrival of first Ulster Scots in Ireland" (PDF). Irish News. 24 April 2006. Archived from the original (PDF) on 27 September 2007. Retrieved 18 September 2007. ↑ "History of Belfast Castle". Tourism and venues. Belfast City Council. 2014. Retrieved 19 May 2014. ↑ Connolly, Sean J. (2008). Divided Kingdom; Ireland 1630–1800. Oxford University Press. pp. 434–449. ISBN 978-0-19-958387-4. ↑ "Cranes to remain on city skyline". BBC News. 9 October 2003. Retrieved 12 March 2007. ↑ Ryland, Frederick (1897). Events of the Reign 1837–1897. London: George Allen. p. 101. OCLC 267093697. ↑ "The Belfast blitz is remembered". BBC News. 11 April 2001. Retrieved 12 March 2007. ↑ Kelters, Seamus (February 2013). "Violence in the Troubles". History. BBC. Retrieved 19 May 2014. ↑ Ó Dochartaigh, Niall (1999). From Civil Rights To Armalites. Cork University Press. p. 292. ISBN 978-1-85918-108-9. ↑ "Sutton Index of Deaths". CAIN. 11 April 2001. Retrieved 9 July 2013. Search for Belfast in "Text Search of Description (and key words)"
↑ "Ten years on – Victoria Square celebrates £2 billion in sales". The Irish News. 6 March 2018. Retrieved 4 March 2019. ↑ Edwards, Ruth Dudley (11 December 2012). "The rioters shouldn't worry – Ulster is safe". The Telegraph . Retrieved 1 June 2018. ↑ "Belfast City Hall: History and Background". Belfast City Council. Archived from the original on 4 May 2007. Retrieved 24 May 2007. 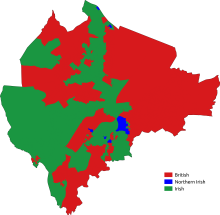 ↑ "Local Government (Boundaries) Act (Northern Ireland) 1971". Conflict Archive on the Internet (CAIN). 2007. Archived from the original on 7 July 2007. Retrieved 24 May 2007. 1 2 "Councillors: Lord Mayor". Belfast City Council. Archived from the original on 7 June 2007. Retrieved 24 May 2007. ↑ "Belfast City Council Elections 1993–2005". Northern Ireland Elections. Northern Ireland Social and Political Archive (ARK). 2005. Archived from the original on 8 June 2007. Retrieved 24 May 2007. ↑ "Belfast signs Sister Cities accord with Boston". belfastcity.gov.uk. ↑ "Sister Cities Online Directory: UK, Europe Sister Cities International Archived 27 February 2017 at the Wayback Machine . Retrieved 17 November 2011. ↑ Black, Rebecca (25 March 2014). "Belfast and Boston to be named sister cities –". Belfasttelegraph.co.uk. Retrieved 2 August 2014. ↑ Ellement, John (12 May 2014). "Boston signs sister city agreement with Belfast". Boston Globe. Retrieved 12 May 2014. 1 2 3 "Introduction To Titanic – Titanic in History". Titanic. Built in Belfast. Ulster Folk and Transport Museum. Archived from the original on 17 August 2007. Retrieved 18 May 2007. ↑ "Sunrise and sunset in Belfast". Sun Calculator. time and date.com. Retrieved 18 May 2007. ↑ "Lagan Weir – Why it exists". Laganside. Archived from the original on 18 April 2007. Retrieved 25 May 2007. ↑ "Area Measurements in Northern Ireland". 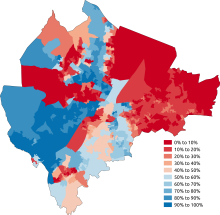 2001 census Data. Northern Ireland Statistics & Research Agency. 2001. Archived from the original on 17 June 2007. Retrieved 18 May 2007. ↑ "Belfast City: Did you know?". Discover Ireland. Tourism Ireland. 2007. Archived from the original on 28 September 2007. Retrieved 18 May 2007. ↑ "Belfast Hills". Discover Northern Ireland. Northern Ireland Tourist Board. Retrieved 18 May 2007. ↑ "About the Cave Hill". The Cave Hill Conservation Campaign. 2007. Archived from the original on 6 February 2007. Retrieved 25 May 2007. ↑ "Station Locations" . Retrieved 23 September 2011. 1 2 3 "Climate: Northern Ireland". Met Office. Retrieved 25 May 2007. ↑ "2001 Minimum" . Retrieved 23 September 2011. ↑ "Belfast, Northern Ireland – Average Conditions". BBC Weather Centre. BBC. Archived from the original on 15 January 2009. Retrieved 8 October 2009. ↑ "Rainfall in Ireland". Met Éireann. Archived from the original on 2 June 2007. Retrieved 25 May 2007. ↑ "1983 Maximum". Eca.knmi.nl. Retrieved 23 September 2011. ↑ "1981–2010 average warmest day". Eca.knmi.nl. Retrieved 23 September 2011. ↑ ">25c days". Eca.knmi.nl. Retrieved 23 September 2011. ↑ ">Jan 1982 Minimum". Eca.knmi.nl. Retrieved 23 September 2011. ↑ ">Air frost Incidence". Eca.knmi.nl. Retrieved 23 September 2011. ↑ ">Dec 2010 minimum". Metofficenews.wordpress.com. Retrieved 23 September 2011. ↑ "Annual average warmest day" . Retrieved 22 September 2011. ↑ ">25c days" . Retrieved 22 September 2011. ↑ ">Annual average coldest night" . Retrieved 22 September 2011. ↑ ">Average frost incidence" . Retrieved 22 September 2011. ↑ "Belfast 1981–2010 Averages". KNMI . Retrieved 15 June 2016. ↑ "Belfast Extreme Values". KNMI . Retrieved 15 June 2016. ↑ "Belfast Stormont Castle 1981-2010 average extreme values". KNMI . Retrieved 28 December 2017. ↑ "Belfast International Airport 1981-2010 Averages". Met Office. Retrieved 4 September 2017. ↑ "Belfast International Airport 1961-1990". NOAA. Retrieved 4 September 2017. ↑ "Belfast International Airpoirt (Aldergrove) extreme values". KNMI . Retrieved 8 November 2011. ↑ "Belfast International Airpoirt 1981-2010 average extreme values". KNMI . Retrieved 28 December 2017. ↑ Margrethe C. Lauber. "Belfast's Peacelines: An Analysis of Urban Borders, Design and Social Space in a Divided City". Archived from the original on 8 February 2007. Retrieved 18 May 2007. ↑ ""A Process for Removing Interface Barriers", Tony Macaulay, July 2008" (PDF). Archived from the original (PDF) on 6 October 2011. Retrieved 12 August 2010. ↑ "Major makeover for Belfast city Centre". Department for Social Development (NI). 12 June 2007. Archived from the original on 28 September 2007. Retrieved 12 June 2007. ↑ "The Arterial Routes". Belfast Metropolitan Area Plan 2015 Draft Plan. The Planning Service. Archived from the original on 18 May 2014. Retrieved 18 May 2014. ↑ "The UK Postcode System". List Masters. 2005. Archived from the original on 24 June 2007. Retrieved 12 June 2007. 1 2 "The Cathedral Quarter, Belfast". Northern Ireland Tourist Board. 2014. Retrieved 18 May 2014. ↑ "Gaeltacht Quarter". Department of Culture, Arts and Leisure. 2007. Archived from the original on 27 September 2007. Retrieved 15 January 2016. ↑ "Contact Details". The Ulster Museum. 2007. Archived from the original on 29 May 2007. Retrieved 18 May 2007. ↑ "The Golden Mile: Pub Crawl". Virtual Belfast. Archived from the original on 24 June 2007. Retrieved 25 May 2007. ↑ "Shopping at a Glance". Visit South Belfast. South Belfast Partnership. Archived from the original on 17 July 2011. Retrieved 18 May 2007. ↑ Burns, Gemma (28 February 2007). "A passion for preserving Belfast's beauty". South Belfast News. Archived from the original on 27 September 2007. Retrieved 12 March 2007. 1 2 "Corporate Message: The Vision". About Us at Titanic Quarter. Titanic Quarter. 2006. Archived from the original on 3 May 2007. Retrieved 18 May 2007. ↑ "The best place to live in the UK in 2018". theweek.co.uk. ↑ "Five Northern Ireland Locations Named Among the Sunday Times Best Places to Live 2018". lovebelfast.co.uk. 16 March 2018. ↑ Edworthy, Sarah (31 March 2017). "A gourmand's guide to Belfast: Michelin-starred dining to artisan markets" . Retrieved 10 April 2019. ↑ Krishna, Dutta (2003). Calcutta: A Cultural and Literary History. Signal Books. p. 132. ISBN 978-1-902669-59-5. ↑ Wines, Michael (25 May 2006). "Where the Road to Renaming Does Not Run Smooth". The New York Times. Archived from the original on 16 April 2009. Retrieved 1 October 2007. 1 2 3 "Historic Belfast: A guide to the City's landmark buildings". Go To Belfast. Archived from the original on 18 June 2007. Retrieved 23 May 2007. ↑ Morgan, Ian (4 March 2007). "Ireland's tallest building to be turned into flats". 24dash.com. Archived from the original on 29 September 2007. Retrieved 2 June 2007. ↑ "BBC seeks stars of Belfast film noir". BBC News Northern Ireland. 23 February 2007. Retrieved 23 May 2007. ↑ "Harland and Wolff complete SeaRose Dry-Docking project". Harland and Wolff. Retrieved 20 June 2014. ↑ "Grand Opera House". Cinema Treasures. Retrieved 1 June 2007. ↑ "Neeson in bid to revive theatre". BBC News. 10 December 2004. Archived from the original on 16 January 2008. Retrieved 7 December 2007. ↑ "Home". Laganvalley.co.uk. Retrieved 11 April 2018. 1 2 "Parks and gardens". gotobelfast. 1 April 2007. Retrieved 16 May 2009. ↑ "Why city art is being put on the map". BBC News. Retrieved 18 May 2014. ↑ "Your City, Your Space strategy" (PDF). Belfast City Council. p. 49. Archived from the original on 7 February 2012. Retrieved 18 May 2007. ↑ "About the Field Club". Belfast Naturalists' Field Club. Retrieved 18 May 2014. 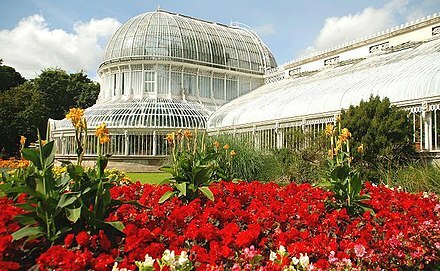 ↑ "Palm House Botanic Gardens, Belfast City". Houses, Castles and Gardens of Ireland. Archived from the original on 13 May 2008. Retrieved 18 May 2007. ↑ "Tropical Ravine". Belfast City Council. Archived from the original on 17 May 2009. Retrieved 30 May 2009. 1 2 "Sir Thomas and Lady Dixon Park and City of Belfast International Rose Garden". Go To Belfast. Archived from the original on 31 May 2007. Retrieved 18 May 2007. ↑ "Sir Thomas and Lady Dixon Park". Discover Northern Ireland. Northern Ireland Tourist Board. Archived from the original on 15 June 2007. Retrieved 18 May 2007. ↑ "Parks and gardens". belfastzoo. 1 April 2007. Archived from the original on 14 April 2009. Retrieved 16 May 2009. 1 2 3 "Comparative Demography Profile: Belfast District Council, Northern Ireland". 2001 census data (Crown Copyright). Northern Ireland Statistics & Research Agency. 2001. Archived from the original on 27 September 2007. Retrieved 17 May 2007. 1 2 "Area Profile of Belfast Metropolitan Urban Area (BMUA)". 2001 Census data. Northern Ireland Statistics & Research Agency. 2001. Archived from the original on 27 September 2007. Retrieved 16 May 2007. ↑ Pointer, Graham. "The UK's major urban areas" (PDF). UK National Statistics. Archived from the original (PDF) on 30 November 2007. Retrieved 7 December 2007. 1 2 Stephen, Roulston (2006). "Urban Structure: Growth of Belfast". Geography in Action. National Grid for Learning. Archived from the original on 15 April 2007. Retrieved 18 May 2007. 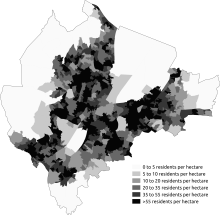 ↑ "Population Density: QS102NI (administrative geographies)". Northern Ireland Statistics and Research Agency. 2011. Retrieved 30 May 2014. ↑ "Northern Ireland Multiple Deprivation Measure" (PDF). Department of Finance and Personnel. May 2005. Retrieved 29 August 2017. ↑ Stephen, Roulston (2006). "Ethnic Diversity: Segregation in Belfast. Introduction to Ethnic Diversity in Belfast". Geography in Action. National Grid for Learning. Archived from the original on 18 May 2007. Retrieved 18 May 2007. ↑ Lloyd, C. (2003). "Measuring local segregation in Northern Ireland" (PDF). Centre for Spatial Territorial Analysis and Research (C-STAR). Retrieved 12 March 2006. ↑ Doherty, P. (1995). "Ethnic Residential Segregation in Belfast". Centre for the Study of Conflict: Chapter 8. Archived from the original on 3 March 2006. Retrieved 12 March 2006. ↑ Belfast Interface Project (2017). "Interface Barriers, Peacelines, and Defensive Architecture" (PDF). Belfast Interface Project. Retrieved 2 February 2018. ↑ O'Hagan, Sean (21 January 2012). "Belfast, divided in the name of peace". The Guardian. Retrieved 2 February 2018. ↑ "Ethnic minorities: Who lives here?" (PDF). Northern Ireland Learning: Teacher's Notes. BBC. Archived (PDF) from the original on 5 June 2007. Retrieved 24 May 2007. 1 2 3 4 "Northern Ireland Neighbourhood Information Service" . Retrieved 11 June 2015. 1 2 "Northern Ireland Neighbourhood Information Service" . Retrieved 11 June 2015. ↑ "About Us". Belfast Islamic Centre. 2007. Archived from the original on 7 July 2007. Retrieved 24 May 2007. ↑ "Hinduism". Primary Focus: Programme 1 – Indian Community. BBC. Retrieved 8 October 2007. ↑ "Durkan "hopeful" For Future of Good Friday Agreement". Department of Finance and Personnel. Archived from the original on 12 October 2007. Retrieved 17 September 2007. ↑ "House of Commons Hansard Written Answers for 13 February 2002". House of Commons. Retrieved 17 September 2007. ↑ "U2 Tower strikes bad chord with residents". BBC News. 7 August 2006. Retrieved 13 March 2007. ↑ "Monthly Labour Market Report". Department of Enterprise, Trade and Investment. 15 February 2006. Archived from the original on 27 September 2007. Retrieved 18 May 2007. ↑ "Employment". National Statistics. Office for National Statistics. March 2006. Archived from the original on 18 May 2007. Retrieved 18 May 2007. ↑ Morgan, Oliver (1 April 2007). "From bombs and bullets to boom towns". The Guardian. London. Retrieved 16 May 2007. ↑ "Northern Ireland Reaches Watershed in House Price Growth" (Press release). University of Ulster. 15 November 2007. Archived from the original on 17 December 2007. Retrieved 10 December 2007. ↑ Carson, Helen (28 February 2007). "Typical price of Ulster home edges ever closer to £200,000". The Belfast Telegraph. Archived from the original on 2 March 2007. Retrieved 13 March 2007. ↑ "House Owner Occupation Rates" (Press release). Halifax. 19 November 2004. Archived from the original (DOC) on 5 June 2007. Retrieved 18 May 2007. ↑ Belfast 2005: Tourism Facts and Figures (PDF). Belfast: Belfast City Council. 2006. Archived from the original (PDF) on 5 June 2007. Retrieved 18 May 2007. ↑ "Record number of visitors come to Belfast". GO Belfast. July – August 2007. p. 6. ↑ "Invest in Belfast: A 2007 City Guide for Investors". Belfast City Council. Archived from the original on 10 October 2007. Retrieved 18 May 2007. ↑ "Belfast 'UK's fastest-growing economy'". Wilson-nesbitt.com. 30 June 2008. Archived from the original on 18 July 2011. Retrieved 12 August 2010. 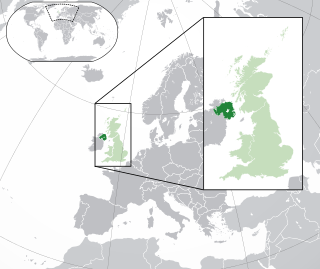 1 2 "Northern Ireland – Overview". The Times. Bcglocations.com. Archived from the original on 4 November 2006. Retrieved 12 August 2010. ↑ "The New Celtic Tiger: Belfast is Open for Business". Der Spiegel. 4 July 2008. Retrieved 12 August 2010. 1 2 3 Beckett, JC; et al. (2003). Belfast, The Making of the City. Chapter 1: Belfast to the end of the eighteenth century. Belfast: Appletree Press Ltd. pp. 13–26. ISBN 978-0-86281-878-4. ↑ McCreary, Alf (22 January 2014). "The Industrial Revolution transformed Belfast, making it Ireland's biggest city – and it all began with the port". The Belfast Telegraph . Retrieved 25 May 2014. 1 2 Beckett, JC; Boyle, E (2003). Belfast, The Making of the City. Chapter 3: "Linenopolis": the rise of the textile industry. Belfast: Appletree Press Ltd. pp. 41–56. ISBN 978-0-86281-878-4. ↑ Beckett, JC; Sweetman, R (2003). Belfast, The Making of the City. Chapter 4: The development of the port. Belfast: Appletree Press Ltd. pp. 57–70. ISBN 978-0-86281-878-4. ↑ "Corporate Series Northern Ireland" (PDF). Corporate Northern Ireland 2007. Corporate Series. Archived from the original (PDF) on 16 February 2008. Retrieved 7 December 2007. 1 2 "Northern Ireland – Where is the bright new future?". Management Today. 23 March 2006. Retrieved 16 May 2007. 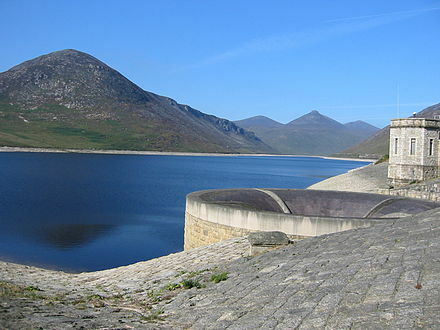 ↑ "The Silent Valley". Northern Ireland Water. 2007. Retrieved 30 May 2014. 1 2 "Strategic Plan Framework: Public Services and Utilities". Draft Belfast Metropolitan Area Plan 2015. The Planning Service. Archived from the original on 27 September 2007. Retrieved 26 May 2007. ↑ "Water Reform Implemented: Secretary of State announces deferral of charges". Water Reform NI. March 2007. Archived from the original on 9 June 2007. Retrieved 26 May 2007. ↑ "Summary of domestic rating reforms". Department of Finance and Personnel. 2005. Archived from the original on 5 May 2007. Retrieved 26 May 2007. ↑ "Domestic Rates Reform". Fair Rates Campaign. Archived from the original on 28 September 2007. Retrieved 26 May 2007. ↑ "Review of Public Administration: Consultation On Draft Legislation To Establish Five New Integrated Health And Social Services Trusts" (PDF). DHSSPS. Archived (PDF) from the original on 27 September 2007. Retrieved 17 September 2007. ↑ Payne, William (September 1998). "Hospital Development:PFI beyond DBFO". ProQuest Information and Learning Company. Archived from the original on 18 January 2008. Retrieved 6 May 2007. 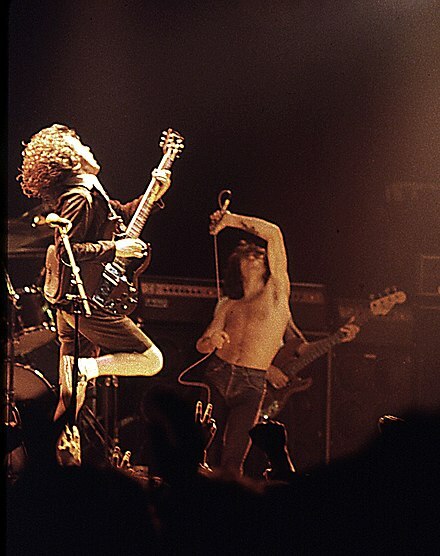 ↑ Morrison, PJ (2006). "Improving cancer statistics – a new cancer centre for Northern Ireland". The Ulster Medical Journal. 75 (2): 110. PMC 1891734 . PMID 16755938. ↑ "Belfast City Hospital: About the Unit". The Renal Association. November 2006. Archived from the original on 31 December 2015. Retrieved 24 May 2007. ↑ "TRH open Northern Ireland's first Regional Acquired Brain Injury Unit". The Prince of Wales. 15 May 2006. Archived from the original on 7 March 2007. Retrieved 6 May 2007. ↑ "M2 / M22 Motorway". Wesleyjohnston.com. Retrieved 12 August 2010. 1 2 Northern Ireland Statistics and Research Agency (18 October 2005). "Travel Survey for Northern Ireland 2002–04". Department for Regional Development. Archived from the original (PDF) on 19 May 2007. Retrieved 6 May 2007. ↑ "The Official Opening of the M1/Westlink Improvement Scheme". The Department for Regional Development. 12 March 2009. Archived from the original on 27 December 2010. Retrieved 1 February 2011. ↑ "Road Improvements Schemes – In Planning". The Department for Regional Development NI. ↑ "York Street Interchange – Scheme Homepage". The Department for Regional Development NI. 26 November 2009. Archived from the original on 10 June 2013. ↑ Nutley, Stephen D. (1990). Unconventional and Community Transport in the United Kingdom. Gordon and Breach Science Publishers. pp. 318–322. ISBN 9782881247644. ISSN 0278-3819. ↑ "Metro Corridor & Zone Guide". Translink Metro. 27 August 2012. Archived from the original on 11 July 2014. Retrieved 2 June 2014. 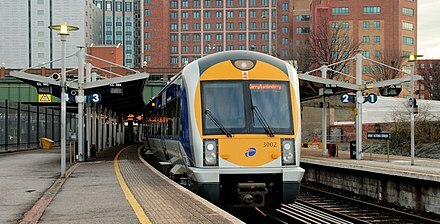 ↑ "London to Belfast by train & ferry from £55". Seat61.com. Retrieved 11 April 2018. ↑ Fitzmaurice, Maurice (27 August 2018). "Glider buses to let passengers on from TOMORROW as part of test run". belfastlive. Retrieved 23 November 2018. ↑ "video No light rail system for city". BBC News. 8 April 2008. Retrieved 30 May 2009. ↑ "City to get rapid transit network". BBC Northern Ireland. 8 April 2008. Archived from the original on 9 April 2008. Retrieved 4 April 2008. ↑ Northern Ireland Statistics and Research Agency (28 September 2006). "Northern Ireland Transport Statistics Annual 2005–2006". Department for Regional Development 555,224 passengers in 2009. Archived from the original (PDF) on 19 May 2007. Retrieved 2 May 2007. ↑ "Summary of the bid". 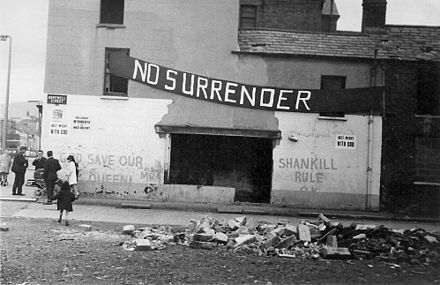 One Belfast Where Hope and History Rhyme (Internet Archive). Imagine Belfast 2008. 22 November 2002. Archived from the original on 7 December 2002. Retrieved 24 May 2007. ↑ "The official websites on UK bids for European capital of culture 2008". The Guardian. London. 30 October 2002. Retrieved 13 March 2007. ↑ Ward, D; Carter, H (31 October 2002). "Six cities shortlisted for culture capital bid". The Guardian. London. Retrieved 13 March 2007. 1 2 "Integrated Cultural Strategy for Belfast" (PDF). Capital City: Belfast City Councils Development Agenda. May 2006. Retrieved 24 May 2007. ↑ "Welcome to the new season". Ulster Orchestra Society. Archived from the original on 5 February 2007. Retrieved 24 May 2007. ↑ "The History of Belfast Underground Clubs". www.belfastundergroundclubs.com. Retrieved 7 February 2016. 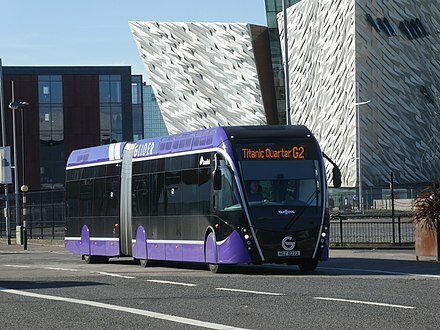 ↑ "ComharthaÃ Bus Gaeilge san Iarthar / Irish language bus signs in the West | Here comes the new Belfast". Forbairtfeirste.com. Retrieved 2 August 2014. ↑ Dawn McCarty; Jef Feeley; Chris Dixon (24 July 2018). "James Cameron: Getting Titanic Artifacts to U.K. Would Be 'a Dream'". National Geographic. Retrieved 2 September 2018. ↑ Dawn McCarty; Jef Feeley; Chris Dixon (31 August 2018). "Bankrupt Titanic exhibitor sets biggest sale of ship relics". Bloomberg. Retrieved 2 September 2018. ↑ "Research Guide: Irish News & Newspapers". Boston College. 2007. Archived from the original on 9 August 2007. Retrieved 24 May 2007. ↑ Johnston, Ruth. "Belfast News Letter". Your Place and Mine. BBC. Retrieved 24 May 2007. ↑ "About Homely Planet". Homelyplanet.org. Archived from the original on 5 December 2013. Retrieved 20 May 2014. ↑ Henry, Lesley-Ann (2 March 2011). "MTV Europe Music Awards to be held in Belfast". The Belfast Telegraph. Retrieved 14 November 2011. ↑ Jones, Lucy (6 November 2011). "MTV Europe Music Awards 2011: as it happened". The Daily Telegraph . Retrieved 20 May 2014. ↑ "Belfast Marathon breaks 20,000 barrier". Belfast City Council. 18 April 2011. Archived from the original on 24 September 2011. Retrieved 9 July 2011. ↑ "FIFA/Coca-Cola World Rankings". FIFA. August 2017. Retrieved 4 September 2017. ↑ McCann, Nuala (3 December 2005). "A city mourns for the Belfast Boy". BBC News Northern Ireland. BBC. Retrieved 18 May 2005. ↑ "George Best Memorial Trust". George Best Trust. Archived from the original on 29 September 2007. Retrieved 18 May 2007. ↑ "Antrim chief in protest at Maze games". Sunday Mirror. 13 March 2005. Archived from the original on 18 January 2008. Retrieved 17 September 2007. ↑ "Civil Service Cricket Club". ESPNcricinfo. ESPNSports Media. 16 July 2015. Retrieved 4 January 2017. ↑ Ireland, Culture Northern (30 January 2009). "Pro Wrestling Ulster". Culture Northern Ireland. Retrieved 14 March 2017. ↑ "Snooker on the ropes – Hurricane". BBC. 16 April 2007. Archived from the original on 21 August 2007. Retrieved 17 September 2007. ↑ "WBA History". World Boxing Association. Archived from the original on 11 October 2007. Retrieved 17 September 2007. ↑ Meredith, Robbie (17 July 2018). "Branagh granted freedom of Belfast". BBC News. ↑ Dennis Barker. "Frank Carson obituary". The Guardian. London. Retrieved 6 September 2018. ↑ "Narnia comes to Belfast". BBC News. 23 November 2016. ↑ "About The Russell Group: Aims and objectives". The Russell Group. 2007. Archived from the original on 7 June 2007. Retrieved 24 May 2007. ↑ "About Queen's: Facts and Figures". Queen's University Belfast. 2007. Archived from the original on 13 May 2007. Retrieved 24 May 2007. ↑ "Conflict and Politics in Northern Ireland (1968 to the Present)". Conflict Archive on the Internet (CAIN). 2007. Archived from the original on 30 May 2007. Retrieved 24 May 2007. ↑ "Belfast Metropolitan College – About Us". Belfast Metropolitan College. 2007. Archived from the original on 16 December 2007. Retrieved 12 December 2007. ↑ "About Us: The Roles and Functions of the Belfast Education and Library Board". Belfast Education and Library Board . Retrieved 18 May 2014. ↑ "Schools Database – List of Institutions". Department of Education. Archived from the original on 29 December 2005. Retrieved 24 May 2007. ↑ "Belfast fifth most popular UK tourist destination". Belfast Newsletter. 22 May 2013. Retrieved 19 May 2014. 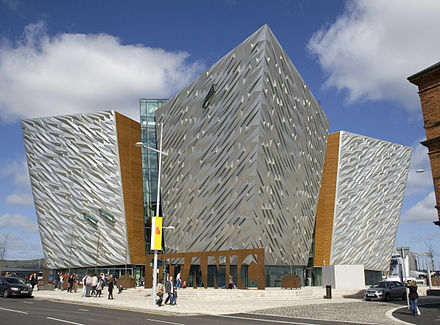 ↑ "Titanic Belfast becomes second most visited tourist attraction on island of Ireland". The Irish Times. Retrieved 19 October 2016. ↑ "Tourism facts and figures – Belfast City Council". Belfastcity.gov.uk. Archived from the original on 13 October 2016. Retrieved 19 October 2016. ↑ "Visit Belfast". visitbelfast.com. Retrieved 4 December 2018. ↑ "Belfast Makes the Top 12". The Daily Telegraph. ↑ Dougan, Patrice (2 April 2012). "Inside Titanic Belfast – a guided tour". The Belfast Telegraph . Retrieved 19 May 2014. ↑ "Telegraph article; Announcement of redevelopment of Titanic Quarter". The Belfast Telegraph. 27 November 2008. Retrieved 30 May 2009. ↑ "Tourist information centre". Tourism. Belfast City Council. 2014. Retrieved 19 May 2014. 1 2 3 "Belfast signs Sister Cities accord with Boston". News. Belfast City Council. 12 May 2014. Retrieved 15 January 2016. ↑ "Belfast signs Sister City Agreement with Shenyang, China today to collaborate in number of areas". News. Belfast City Council. 16 May 2016. Retrieved 26 May 2017. Wikimedia Commons has media related to Belfast . Wikivoyage has a travel guide for Belfast .